Calcium is key for growth and we need plenty of it in our daily food from a very young age. Yet, about half the global population, mostly in Asia and Africa, lack calcium in their diet and are prone to many related ailments ranging from cardiovascular diseases and diabetes to bone loss, which leads to crippling osteoporosis at old age. 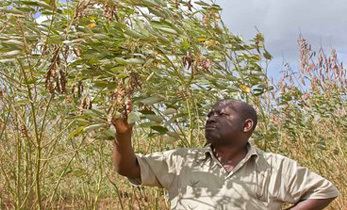 Scientists from Aberystwyth University, UK and the International Crops Research Institute for the Semi-Arid Tropics (ICRISAT) recommend biofortifying finger millet, an already calcium-rich dryland cereal grown in India and Africa, to combat this significant micronutrient deficiency. One woman out of three and one man out of five will be exposed to bone loss and related fractures during their lives and the societal cost is rising fast, both in developed and developing countries. Think of a bone lifesaving account. Children need to get as much calcium as possible during their childhood to prevent osteoporosis which is very difficult to detect at an early stage. In the US, osteoporosis is costing around US$17 billion annually. Different strategies are in place to prevent calcium deﬁciency with contrasting results. Food fortification e.g. breakfast cereals or flours, may not reach the most vulnerable, while supplementation tablets have well documented side-effects. Eating calcium rich food, like dairy products, seems to be the most eﬃcient way to combat calcium deficiency. However, many cannot switch to dairy because of lactose intolerance, purchasing power or being vegan. 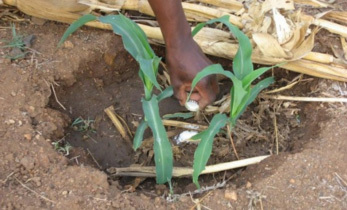 Therefore, selecting (biofortifying) and promoting calcium-rich crops has a great potential to combat calcium deficiency. This is where finger millet stands out. 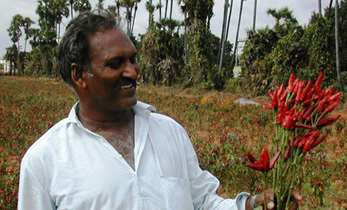 An Indian farmer’s organization in Kolli hills, in Tamil Nadu has been advocating for finger millet (called ragi in India) for years. They grow and market it, they eat it in various ways and value its resilience and health benefits. Here, children eat sprouted finger millet as part of their midday school meal. The group have been processing and packaging this super grain for urban markets, with the support of the MS Swaminathan Research Foundation (MSSRF), Bioversity International and IFAD. This is a survival dryland cereal which can grow with little rain, on poor soils, yet could reach yields of 10 tons per hectare when irrigated. It is the richest source of calcium among cereals, 3 times more than milk and 10 times higher than brown rice or maize. It is traditionally eaten as weaning porridge in some parts of India and Africa. However, eating finger millet is not enough to get its nutritional benefits, our body has to absorb it. This is what a nutritionist calls bioavailability, which is usually quite poor for grains, as it also contains compounds like phytates and tannins that prevent calcium absorption. However, such anti-nutrient compounds are important in plant growth and grain preservation. Tannins for instance prevent mould or insect damage. The way grain is processed and eaten highly influences calcium absorption. 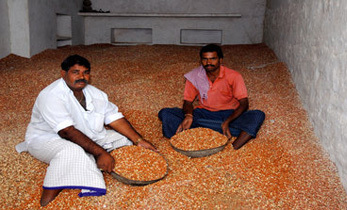 A nutrition study assessing women self-help group diets in rural Karnataka State, India showed that a portion of finger millet consumed two times a day together with one portion of pulses and vegetables, met the recommended calcium daily requirements. The most nutritionally sound way to prepare finger millet is grain decortication followed by malting (germination and heat treatment). But processed grains have a limited shelf life compared to decorticated grains. In Kolli hills, it works well because people have easy access to small village mills and can prepare small quantities depending on their immediate needs. The rest of the harvest can be safely stored for months. 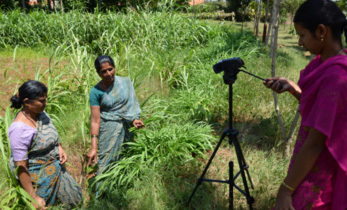 Integrating the Kolli hills nutrition improvement practices could ensure calcium biofortified finger millet delivers its promises. 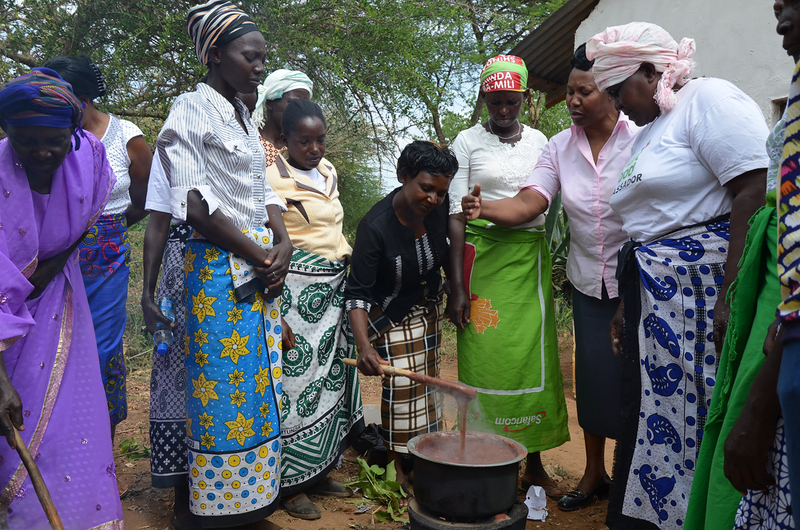 Calcium deficient households could learn the best ways to cook finger millet to minimize the nutrient loss and recipes should suit their palate and preferences. 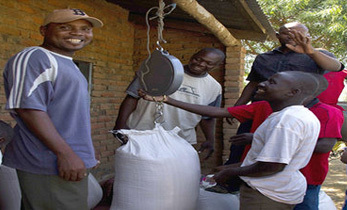 To have a proof of concept for food security decision-makers, Dr Ojulong and his colleagues recommend support in scaling up the initial success of biofortified finger millet in Kenya and Tanzania, as well as implementing pilot nutrition studies for vulnerable groups (like children, nursing or post-menopausal women) in finger millet-eating communities to confirm the extent of finger millet calcium absorption and benefits. Through this approach, which incorporates agriculture, nutrition and health, along with policy and market research, finger millet could combat calcium deficiency in coming years.